TIGERS EYE was designed to offer guests the ultimate escape in complete luxury. The main deck offers a full beam, spacious salon with wet bar and bar stools, formal dining for eight, day head and country kitchen. The interior offers exquisite cherry wood complimented with rich fabrics, creating a warm, comfortable and tranquil environment. 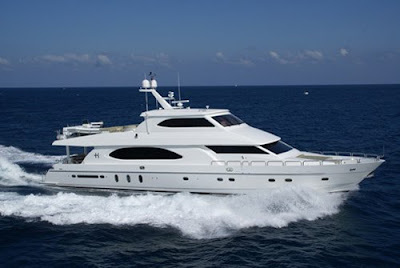 The aft deck offers al fresco dining for eight and access to the wide swim platform. The foredeck is ideal for sunbathing on the luxurious tanning pad. TIGERS EYE accommodates up to 9 guests in 4 elegant staterooms situated on the lower deck and configured as a King master, a VIP Queen, and two Twin staterooms. One Twin stateroom has an additional Pullman berth, comfortably sleeping 3. She offers superior comfort and privacy for each guest. Each stateroom has en suite facilities finished in granite, plenty of storage, and individual climate controls. Every stateroom also includes an entertainment system; the King Master boasting a 42" flat screen television.